Dinosaurs are a hugely popular topic for kids of all ages. When I was a child, I was absolutely obsessed with them – and I still am, to some degree. They’re just so fun to learn about! It’s always been fascinating that creatures that large once roamed the same planet we live on today. 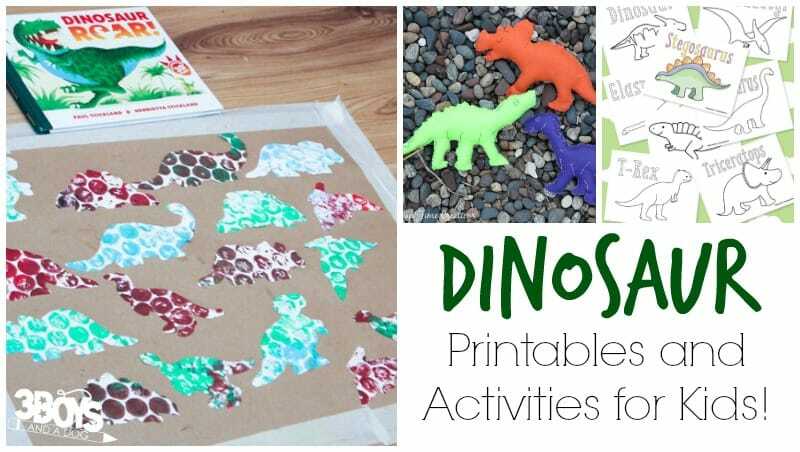 If you’d like to add some dino fun into your learning, try these dinosaur printables and activities for kids! There are crafts, printable activities, and games that your children will love! Help your small ones work on scissor skills with this printable Dinosaurs Preschool Cutting Practice! Play Dinosaur Bingo with your children! Use these Dinosaur Printable Emergent Readers to practice reading fluency! Kids of all ages will love these Dinosaur Coloring Pages! This Dinosaur Tot Pack is perfect for toddlers who are working along with their older siblings! Work on handwriting with this printable Dinosaur Copywork! Need something for your preschooler? Try these Dinosaur PreK Printables! Make these Dinosaur Puppets and put on a show for the family! Watch a dino-themed movie and play this fun Dinosaur Family Movie Night Bingo together! Did you love the movie The Good Dinosaur? 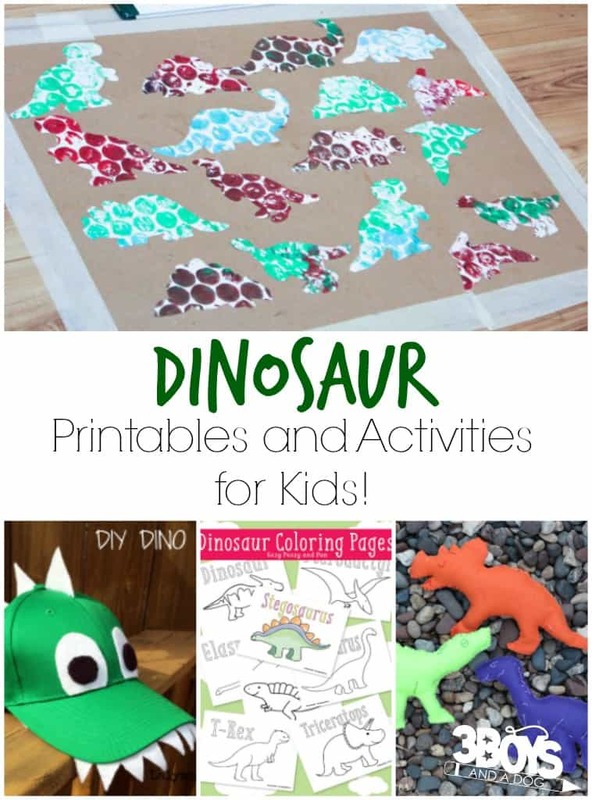 Grab these Printables for The Good Dinosaur! Kids will have fun making these Printable Dinosaur Masks! I love lapbooking. This Printable Dinosaur Lapbook is a fun, hands-on way to do a dinosaur unit! 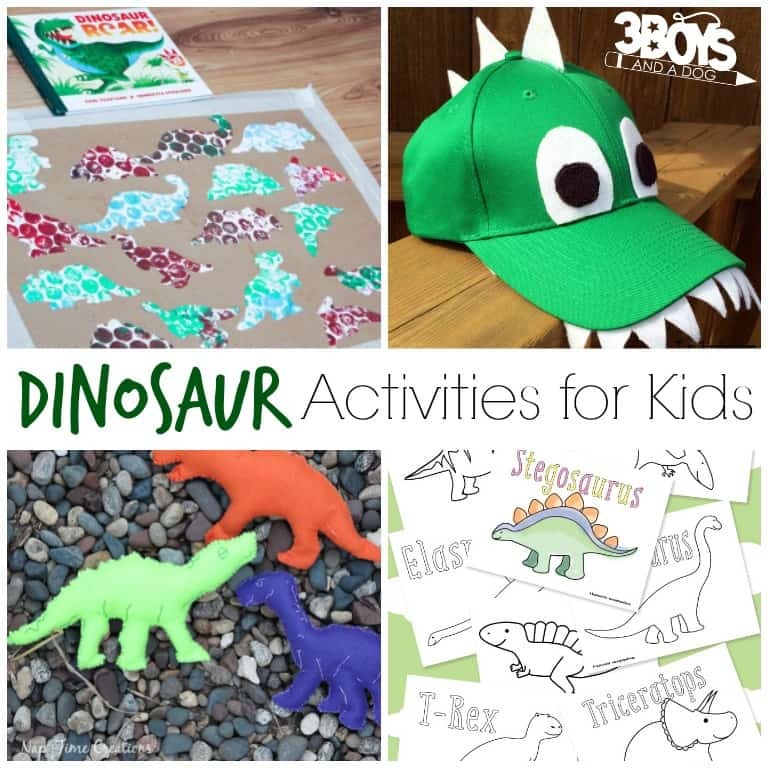 This free Dinosaur PreK Printable Pack includes lots of dinosaur activities for little ones! Use these Dinosaur Counting Cards to practice basic counting! Get the kids outdoor with this Dinosaur Wash Activity! These Felt Dinosaurs are just too adorable! Turn dinosaurs into a homeschool unit with this Hands-On Dinosaur Unit Study for Preschoolers! Let kids pretend to be archaeologists with this Dinosaur Sand Dig! Put some dino fun into a box and make a Dinosaur Activity Bin! These Dinosaur Egg Bath Bombs are a fun craft kids can make and give to others! Use this Paper Plate Dinosaur Toddler Craft to keep little hands busy! Make this Dinosaur Play Dough and have some sensory fun! This DIY Dinosaur Hat is so cute for a dinosaur-themed party! Play this Frozen Dinosaur Egg Excavation Game together! Give your child some sensory exploration with this Dinosaur Sensory Bin! Craft your own DIY Dinosaur Fossils with this fun craft! Learn to make DIY Dinosaur Feet and leave jurassic-sized footprints! Even the smallest kids can get in on this fun Dinosaur Handprint Art activity! Make a super cute Dinosaur Craft with this free pattern! Make these fun DIY Dinosaur Feet Stilts with the kids! Use packing material for this Bubble Wrap Dinosaur Craft! This Dollar Store Dinosaur Fairy Garden makes for inexpensive fun! Your kids will love making and playing with this Edible Slime Dinosaur World! Have some prehistoric alphabet fun with this Dinosaur Alphabet Matching Activity! Use your recyclables to make these Toilet Paper Roll Dinosaur Fossils! Add science into your unit with this Dinosaur Volcano Science Experiment! Little ones can work on gross motor skills with this Dinosaur Gross Motor Movement Game! Make this Dinosaur Paper Hat as a party favor! Take your dino fun with you with this travel Dinosaur Play Dough Kit! Craft your own dinosaurs out of cardboard with these Toilet Roll Dinosaurs! Teach shape recognition with this Dinosaur Shape Game for Kids with Playdough! 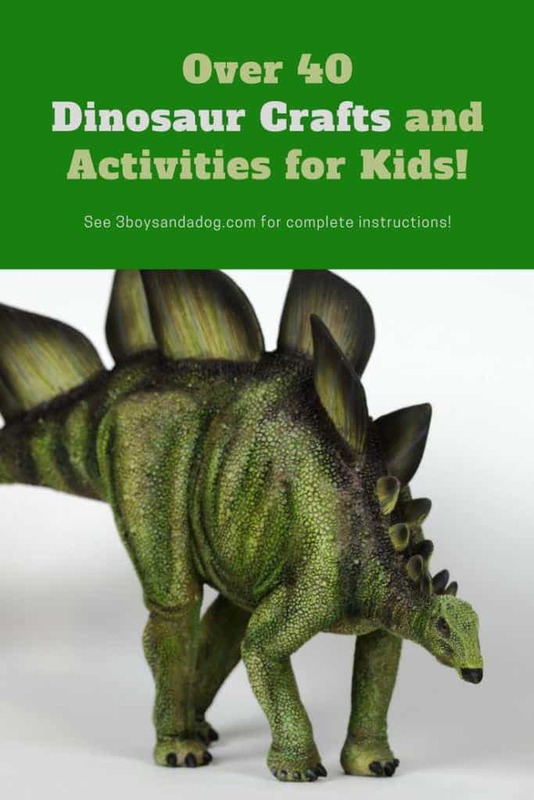 As if this list of dinosaur printables and activities for kids wasn’t enough… check out the Dinosaur Crafts and Activities for Toddlers and Preschoolers at Rainy Day Mum! 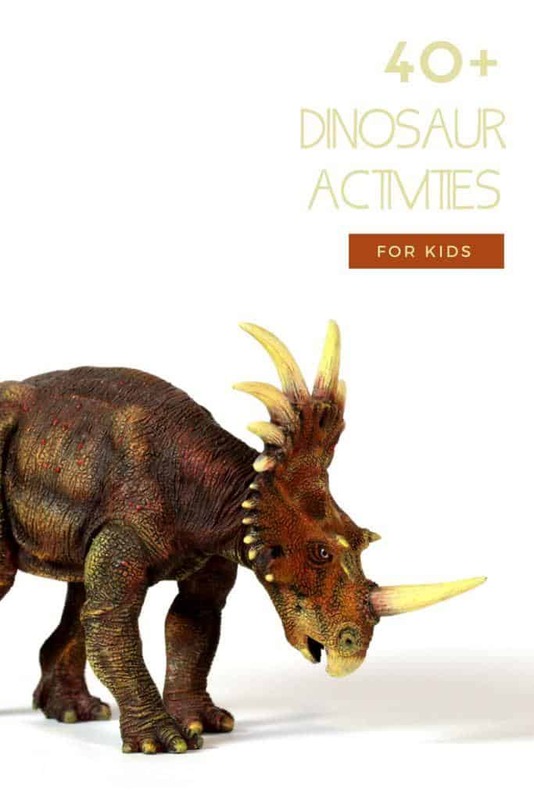 Use these awesome resources from Amazon to help kids have even more dinosaur fun! My husband (Ricky) of 18 years, our three wild and wonderfully different boys, six totally spoiled little dogs, 3 wild cats, and I live at Miller Manor - surrounded by hundreds of acres of farmland, in a small town on the coast of Southern Alabama. OMG My son would love ALLL of these! Going to have to pin it for sure!